What solar rebates are currently available? With our long summers, sunny weather and vast tracts of open land, Australia is one of the best places to install a solar energy system for your home or business. Solar (PV) systems provide limitless free energy from the sun’s radiation and are undoubtedly the best small-scale renewable energy source for Aussie households. 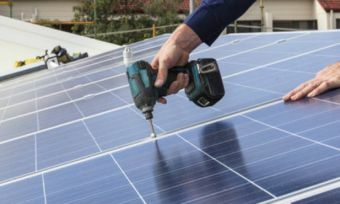 Unfortunately, solar systems are expensive to buy and install, which is where the Australian Government’s rebates come into play. The biggest and most obvious monetary incentive the Government provides is the Small-scale Renewable Energy Scheme. It’s essentially a discount for households which install a renewable energy system, or a sustainably-powered hot water system. Once your system is installed and approved, you can receive small-scale energy certificates (STCs) calculated on the expected output of your system for its life up to 15 years. Electricity retailers must purchase an annual quota of these certificates by law, meaning solar customers may sell them for cash on an open marking. Alternatively if you like, the STCs can be placed with the STC clearing house where you will receive a flat return of $40 per certificate. If you don’t feel like doing this yourself, some solar installers will sell your certificates on your behalf in exchange for a portion of the sale value. The second major incentive is the Government’s ‘feed-in’ tariffs. This is a small rebate of a few cents for each kWh of unused electricity generated by your solar system that is exported into the electricity grid. Some states have mandated feed-in tariff rates, but retailers are usually free to set their own rate so long as it’s above any set minimums. As feed in tariffs are a matter of state policy, rates will therefore differ depending on where you live. See the following links for information relevant to your state. There are further rebates for sustainable electricity use that aren’t limited to solar. Different states offer incentives for things such as energy-efficient appliances, running your pool filter at off-peak times, efficient air conditioning systems and many more – all can be found on the Government’s energy savings website. Keep in mind that rebates aren’t restricted to solar panels – you can also get a rebate on small-scale wind turbines, solar and heat-pump hot water, or even hydro power systems.